Denim Days are Far from Over: Gap’s VP of Denim Design Shares Why Gap Jeans Are Where It’s At | Gap Inc. 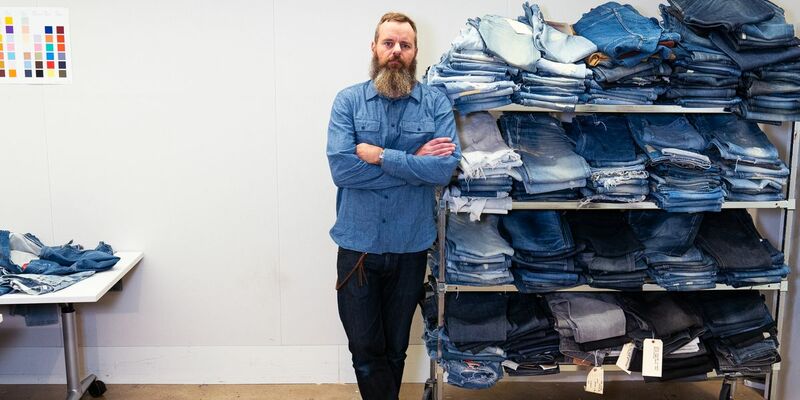 In a room with neatly folded jeans stacked from floor to ceiling, stands Gap’s VP of Denim Design, Alex Gray wearing (you guessed it) head-to-toe denim. His passion for denim verges on obsession (ours, too), and he’s definitely in the right place for it. We sat down with Alex and heard from him on his love for the Gap brand, where his denim obsession came from, and where he finds some of his best inspiration. How did you become the Head of Denim Design for Gap? I grew up in the UK, and my mum taught me how to sew, pattern cut and grade. I went to art college in Southeast London to pursue a career in design. After graduating, I was fortunate enough to work for a few different brands heading up their denim teams before getting the call to come work at Gap’s London office. I joined the Men’s Gap design team with responsibility for denim, woven bottoms, tees and sweats. After 5 years, I got the opportunity to move my family to Los Angeles with the company, which was incredible. Then, we moved to the New York offices to oversee all denim design for the company. The company has been really good to me. There was obviously a bit of luck in terms of timing on my part, but I’ve had great opportunities to grow here. We’re sensing a bit of a pattern here… Why do you love denim? It’s an obsession! There is no other product, other than leather, that wears and improves with age the way that denim does. It’s a timeless, iconic fabric. It has personality and tells the story of its wearer by how much it has been loved or worn over time. Because it’s such a classic, there are a lot of brands producing 5-pocket jeans — a true classic — and it’s up to us to make our jeans stand out. We have a huge responsibility at Gap to deliver on all the things that Gap has staked its claim on: consistency of ideas, authenticity, inclusivity for all, comfort, and attention to detail (and great denim!). So how do you get inside the mind of the customer and make our denim stand out? We do store visits, and we talk to customer. I try not to hassle anyone while they’re shopping, but I love listening to their conversations and looking at which product they are gravitating towards. We also have focus groups that are really, really interesting. We recently did a test on high rise jeans for women and it was amazing how people’s perception of a fit can change once they tried on the jean. It proved that we need to get people into our denim to win them over. Growing up in the UK, I had such an admiration and appreciation for American brands. So many pieces of the modern wardrobe are iconic to Gap! There aren’t that many brands that can say that. One of the first American brands on High Street was Gap, and they were presenting quality and a level of authenticity that no one else had at the time. With 50 years of history, the brand has stood the test of time. I think there are brands out there that would pay a great deal to have that. It’s a real treat to work in a brand that has that in its DNA. What has been your proudest moment working at Gap? I genuinely feel like the product we make is the best quality out there for the best price. It’s a real point of pride that we can offer a fabric as good as our Japanese Kaihara at such a great price. Also, from a wider impact point of view, it’s been incredible to see our sustainability efforts gather some momentum from where we were when I started. Working at a place that cares about giving back is super important to me. Vintage clothing. The detail and thought that used to go into clothes back in the day is remarkable, particularly the stitch work and fabric quality. Sometimes we will go to vintage warehouses, and I’ll spend all day looking through old denim pieces — even sweatshirts and T-shirts. I’ve even taken some vintage pieces apart to see how they were constructed. Endless amounts of inspiration there. I’d love to collaborate with the Head of Patagonia, Yvon Chouinard. He’s a great example of actually living and breathing the brand he’s built from the ground up. What’s a fashion trend that never dies? Oh come on, blue jeans and a white tee! Although we already knew that denim is a closet non-negotiable (we’re built on it here at Gap Inc.! ), Alex definitely makes the case for adding a few more pairs to our closets. His love of the brand and passion for his craft can be seen and felt in the product itself — whether you’re holding it in your hands or putting on that perfect pair of Gap jeans. Interested in joining the team that brings those creations to life? Check out Gap’s open design opportunities here.